Numerous political obstacles have slowed down the development of a border wall along the U.S.- Mexico border since Trump has taken office. But the president is keeping his word. Construction of a U.S.-Mexico border wall began Friday in San Diego, Calif., according to U.S. Customs and Border Protection (CBP) officials. The wall included an anti-climbing plate. The “bollard-style wall” will replace 14 miles a flimsy eight foot high barrier made out of recycled metal scraps that was constructed in the 1990s, will be at least twice as tall and will be fortified with an anti-climbing place, a CBP news release said. “Under this President’s leadership, we have a renewed commitment to secure our border,” said Ronald Vitiello, CBP’s acting deputy commissioner. 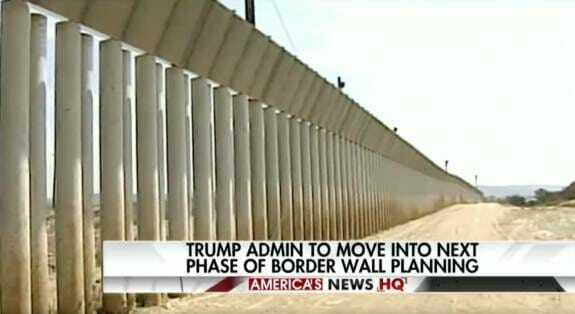 “The new primary wall project represents an important milestone in our work to secure the international border. “Not only does it significantly upgrade our existing infrastructure in San Diego, it also marks the third concurrent wall project in the U.S. and reflects CBP’s unwavering commitment to secure our borders and protect our Nation,” Vitiello continued. Border wall renovations are already underway on two miles of wall in Calexico, California and 20 miles of wall in Santa Teresa, N.M., the CBP said. The U.S. Border Patrol’s San Diego Sector comprises 60 miles of the US-Mexico boundary and is one of the most highly traffic areas for border crossings of illegal immigrants and drugs in the country. Officers arrested more than 26,000 illegal immigrants along the section of the border last year and seized nearly 11,000 pounds of marijuana and 3,000 pounds of cocaine, the New York Post noted. Trump insists he will get Mexico to pay us back for the wall using NAFTA re-negotiations and by potentially freezing remittances from Mexican nationals in the United States. Mexico says that won’t happen.